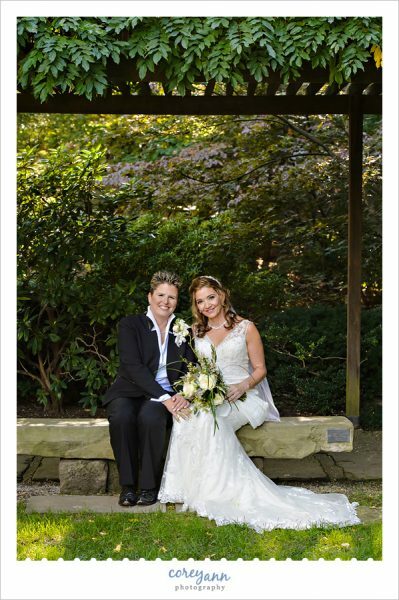 On what may be the most picture perfect October day ever, I joined Ellen and Carolyn for their wedding at the Cleveland Botanical Gardens. It was such a beautiful day – from the gorgeous gardens, to the amazing light, to the BAGPIPER (the Scottish girl in me did a happy dance! 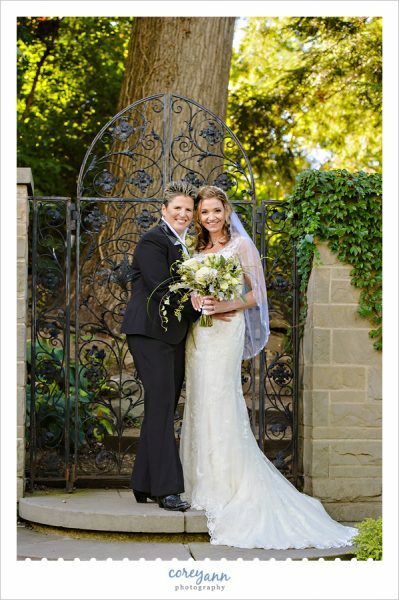 ), to the beautiful love between these two amazing ladies and the love that all of their guests had for them. I photographed these two ladies earlier in the spring last year and I was super excited to see them again. While I love all of my weddings (and without a doubt, I leave every one with an idea I wish I’d used for my own wedding!) their wedding was one that if I had to do everything all over again I would replicate it exactly. They had a smaller guest list which meant that there was a lot of smiles, love and laughs over conversation throughout the day instead of rushed hugs and thanks before moving to the next guest. Their ceremony was one of my favorites of the year and one of the most personal. Their reception was very laid back yet formal enough that you knew you were at a wedding. It just was a picture perfect day. Thank you both so much for trusting me with your day! 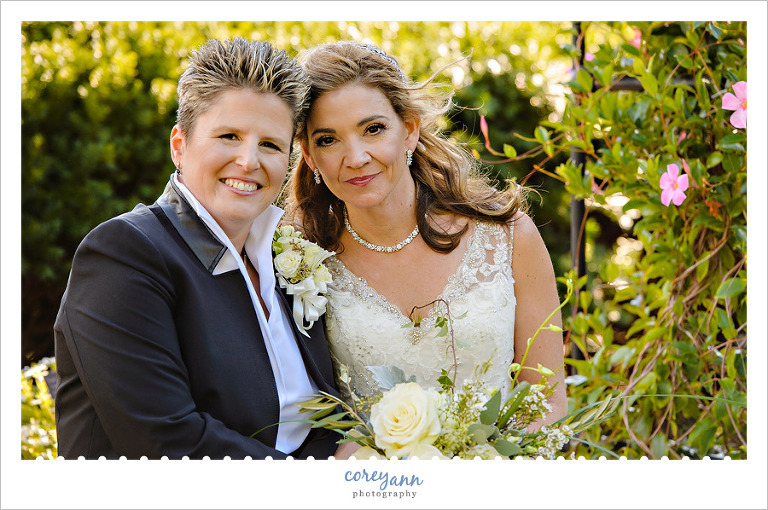 Originally Ellen and Carolyn were to be married in the Japanese Gardens, unfortunately due to rain they ended up moving it up to the restorative gardens. However since when we started their photos it was beautiful out and the rain had passed we decided to start our portraits down in the gardens they had their original hearts set on. They hired a bagpiper to play during portraits which was a really neat way to get into the spirit of things! I really loved these gates and the way the light was coming in at this time of day in this area, so beautiful! When originally talking about their day they both assumed there wouldn’t be anything left blooming by their wedding in the gardens in mid October. However due to a warm and lovely fall, there were still quite a few blooms left! This spot was by far my favorite of the ones we visited, this arbor is so beautiful and the light was amazing! Not only that but these two are amazing! Every time I look at this photo I smile. Ellen looked divine as well, not even kidding I seriously thought about buying this gorgeous Tahari suit after seeing it on her. The best part though was her smile when she looked at her lovely wife to be! Smiles are always more genuine when looking at the one who captures your heart. This bouquet from Flowerville was nothing short of amazing. I loved the texture! Not a bad back up plan right?? The Restorative Gardens are so beautiful! After some family photos we transitioned into the ceremony and it was so perfect. What an entrance, am I right? Their ceremony was one of the most beautiful and personal ones I’ve ever attended. Mary Grigolia did a fantastic job. The readings were perfect and I loved the way that Flowerville was able to make the stands blend in with the gardens. Finally it was time for the vows and they were, of course, perfect. Laughs during the ceremony though are always my favorite. Since they had a smaller group they decided to greet everyone as they exited the ceremony and also pose with each guest which was lovely! It’s something that definitely can’t always be done with most weddings but I loved the idea and I’m glad the weather held out. They had their reception in Woodland Hall which is adjacent to the Restorative Gardens and the decor inside was beautiful. I loved the silver and purple accents and gorgeous arrangements inside. They were all smiles when they entered in! Their first dance was so beautiful! Wild Flour Bakery did their cake and it was not only a feast for the eyes but the belly as well! Their reception was more on the laid back side with not a lot of events but they did take a moment to dance with the men most important to them while music played and guests visited with one another. While everyone was mingling I went outside to capture the very neat lanterns they had set up around the reflective pool! Before leaving I had to play with their amazing rings, aren’t they awesome!? I love the branches on the bands!! Wow!!! 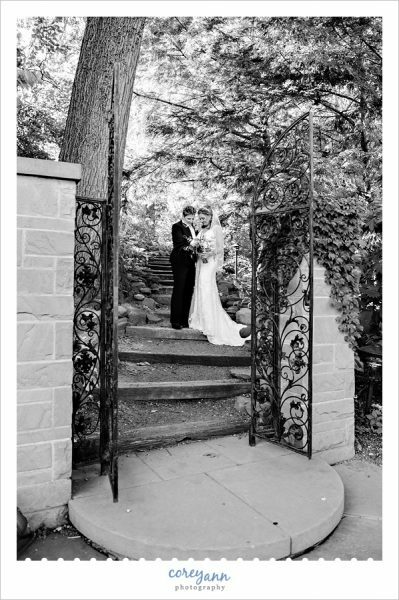 Both brides and the photographs are absolutely stunning!!! Beautiful work, Corey!